"It takes a man of peace to stop a war." 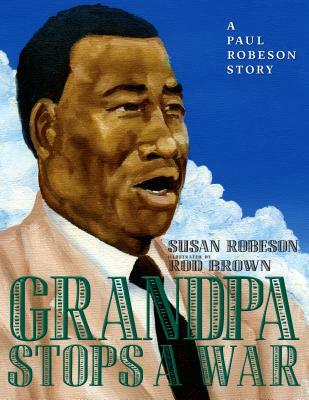 With gorgeous illustrations from fine artist Rod Brown, Grandpa Stops a War celebrates Paul Robeson's global activism and towering achievements, and shows readers the power of music in times of discord and war. An author's note helps readers learn more about the author's personal experience growing up in the Robeson family, and gives parents, teachers, and librarians more in-depth material to expand the reader's understanding of the war and Robeson as a champion of civil rights, global freedom, and world peace. SUSAN ROBESON grew up in West Harlem and spent many of her early years with her grandparents at their book-filled brownstone home in upper Harlem. She is a longtime documentary film and television producer. Her award-winning work has appeared on PBS, NBC and ABC affiliates, and Channel 4 in the UK, and has shown at the Museum of Modern Art, Lincoln Center, the Brooklyn Museum, and numerous film festivals. Her first book, The Whole World In His Hands: A Pictorial Biography of Paul Robeson, was an ALA Best Book for Young Adults. She resides in the New York City area where she is an adjunct professor in film and communications and executive director of the Paul Robeson Foundation. This is her first picture book for young readers. ROD BROWN is a fine artist and the illustrator of We Troubled the Waters and Freedom's a-Callin' Me, both by Ntozake Shange, and From Slave Ship to Freedom Road by Julius Lester, an ALA Best Book for Young Adults. His artwork has been featured in museums such as the Schomburg Center for Research in Black Culture in New York City, and on national television on Oprah's OWN Network and the Nickelodeon program The Legacy of Slavery with Linda Ellerbee. He lives with his wife outside Washington, DC. "Renowned African American singer Paul Robeson and his family lived in London during the Spanish Civil War. Disturbed by reports of homeless families in that country, he gave concerts and sent money, food, and clothing to help Spanish children. Later, he traveled to Madrid. The city was bombed that night, but he led all who were huddled in his dark hotel to sing together. He visited the front, where he sang African American spirituals and songs of freedom with such feeling that soldiers on both sides were moved. 'While Grandpa Paul sang, there was peace.' Susan Robeson, the singer's granddaughter and a documentary filmmaker, retells a family story simply and effectively, and leaves it to listeners to reflect on implicit messages about war, peace, and the power of one gifted, brave, compassionate person to help others. In an appended author's note, she fills in historical details. Brown contributes a series of strong, well-composed paintings using deep, rich colors that capture the book's emotional undertones effectively." "A touching introduction for young readers of the great singer and activist Paul Robeson, told by his granddaughter, with evocative drawings by Rod Brown and intriguing back matter for older readers."